What is this? It's a Touhou RPG with an FBS (Frontal-view Battle System). The FBS reminds me of Final Fantasy Mystic Quest so that's what the game's name is derived from. 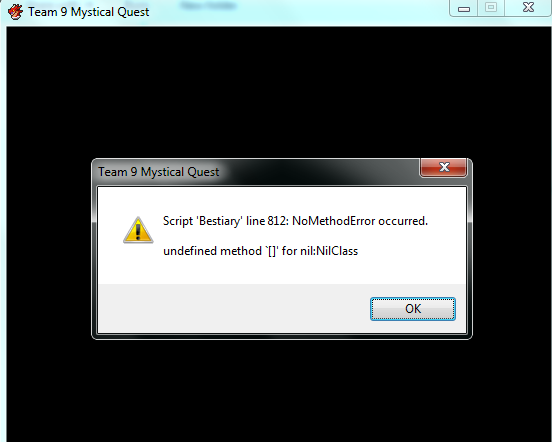 Sadly, the only FBS for RPGmaker that is an exact emulation of Mystic Quest's BS is not available to the public, so I'm using a battle system called Lune FBS instead (If I find a better FBS, I will replace Lune.). The story is that the Three Mischievous Fairies kidnap Daiyousei and Cirno assembles Team ⑨ to get her back. After confronting the trio in the Forbidden Section of the SDM Library, Sunny Milk accidentally unleashes a powerful youkai by the name of Ōgonsekai no Daisanji (If google is correct, this translates roughly to "catastrophe from Utopia" though I wouldn't trust google 100%), who kidnaps Daiyousei and enslaves the Three Fairies. Somehow it all comes down to Team ⑨ to save Gensokyo from Daisanji's evil plan. The story will be broken up into six chapters. Alpha v.2 Chapter 1 - Incompatible with save files from Alpha v.1 due to the bestiary. Alpha v.2.1 Chapter 1 - Compatible with save files from Alpha v.2, copy your save files from the older version into the new folder and you're good to go! Alpha v.3 Chapter 1.5 - Compatible with save files from Alpha v.2.1, but note that doing so can cause up to two bugs to occur. If you must import an old file, do it with characters less than level 10. Alpha v.4.0 - Chapter 2.5 - Compatible with previous save files, but, like before, some bugs might occur if you do. If you must import an old file, do it with characters less than level 17, and make sure it's from BEFORE defeating Elis! Alpha v.5 - Chapter 4 - Previous save files are INCOMPATIBLE with this version. Don't even try. Alpha v.6 - Endgame (Part 1) - Compatible with Alpha v.5 save files, but as before, some bugs may occur if you do. Alpha v.6.1 - Endgame (Part 1) - Identical to the above version, but it fixes an annoying bug involving one of the cutscenes. -The main section of Chapter 5 and 95% of Cirno's Sidequest was added. -Minimum requirements for good ending added. -Final Boss and True Final Boss added. -Kanako and Suwako's bestiary music has been corrected. -Gale Cavern (and Excalipoor) is now inaccessible until after clearing the Sealed Abyss. -Zuh now enters battle with a Killing Machine and a Chaotic Wisp. -Chapter 3 Superboss is now fixed. -Legion Core now counters wind. -That cave at the bottom right of Lower Youkai Mountain actually leads somewhere now. -The Death Mask has been moved to the SDM's second floor, and a new MIAB now takes its place on the first floor. -All Liquid Metal Slimes on Lower Youkai Mountain were removed. -Some disreperancies in the bestiary were corrected. -An optional, "impossible" fight added. -In the Miasma Field, it displays the EXP you would have received instead of the actual modified amount for that area. -Using Enshroud on anyone who isn't named Rumia will cause a message saying "<Party Member> took no damage!" before applying the Enshroud effect. The same applies to using Ice Armor on anyone who isn't named Cirno. -There may be a tiling error here or there on the larger maps, please report any obvious ones. -Single target enemy healing spells will all target the same enemy. -If a boss is killed by something it can counter, it will use its counter attack immediately after dying, potentially causing a Kaizo Trap, depending on the boss. -Humorously, Cagnazzo can counter himself. -If the party members are not lined up behind Cirno, or are not behind the portal, for the final cutscene of chapter 4, the game will freeze because it won't be able to finish the cutscene properly. -Because of the above bug a certain late game boss can be made easier. -Triggering a fight in the arena causes the party to stop gaining XP. -Faulty collisions in Nameless Hill and Muenzuka. -If the battle against Namazu is initiated with Wriggle dead, the post-battle cutscene will result in a game-over. -The dialogue may sound weird or out of character in certain areas. Sorry. -Some areas, such as the Garden of the Sun and the Bamboo Forest of the Lost, are currently using placeholder tilesets due to me being unable to find any suitable tilesets for them on the internet. -There are two type of encounter systems, contact with overworld enemies and random encounters in specified areas. The general rule of thumb is that if there's denser vegetation, there will be random encounters. -Some face graphics, such as Rumia, Wriggle, and Mystia's are currently placeholders and will be replaced when I can find better ones. -All human NPC's that aren't named Touhou characters use stock RPG Maker characters as placeholders. Thus, they look quite weird compared to the Touhou characters. The same is true of Daisanji, the antagonist. -The inn in Mayohiga is a parody of the traditional inns in RPG games. The only real purpose of the structure is to house a save point and recovery spring. -Byakuren can teach the party skills at certain points in the game. -None of the the sprites or music are my own and I do not claim ownership for any of them. All credit should go to the original creators. -Upon returning to the SDM after Mayohiga, if you learned heal from Koakuma, you can talk to her again to learn Fire. This is your only opportunity to learn it. -Relating to the above, you can one-hit Raging Goliath with Fire. Be aware that this will still set off the Kaizo Trap, so make sure you have lots of hp left. -You can annoy Rinnosuke by repeatedly selecting "leave" when speaking to him. -Go ahead. Open the door in the SDM basement. I DARE YOU! -Once you enter Makai, try backtracking into Gensokyo a bit. Perhaps you'll get something helpful if you look in the right place. -The ways to access the two completely optional areas of Makai are based off of NES era cheats. -Related to the above, do not take the contents of the chest in the SDM basement unless you either A. have cleared chapter 4, or B. are confident enough that you can defeat Flandre before starting Chapter 4. -Bring Excalipoor to a certain area of the Abyss to upgrade it. -Tiling errors on larger maps. I look forward to your feedback and support. NOTE: Due to different posting regulations on that forum, the above thread will be updated less frequently than this one. This thread will always be up-to-date. I honestly haven't noticed this... I'm going to download this and see what it's like so far. I feel like the bamboo forest can be really unnecessarily difficult for the 2nd area. I mean 3/4 v 2 low levels is kind of mean. Otherwise I enjoyed it. What do you mean by the 2nd area? Are you referring to the large random-encounter-fest area that takes up 75% of the map? EDIT: Also, which enemies in particular are you having trouble with? Also, I'm glad you enjoyed the game so far. Also, is it possible for you to change text speed? Because slightly fast text would be fantastic. Funny you should say that, because before I made Yukari I gave Cirno a spell called "Freezer Burn" that she learns at level 8. It's still an ice-elemental attack but it has a chance of inflicting a status condition called "Burn". However, Yukari's still only vulnerable to it if the barrier shifts to ice. Besides, I was planning on fire being the only thing you can't hit Yukari with. And here's some useless trivia about the Yukari boss that will be in the next version: There are three other elements that Yukari can shift her weakness to that aren't featured in the video, Wind (which Mystia can hit), Light (Which only Wriggle's flash can hit), and an element called Sap (which governs spells that steal HP or MP from a target, and Rumia will be able to learn a Sap spell at lvl 8 in the next version). I checked the Bamboo forest's encounter listings and that particular formation is not coded to appear in there. Are you mistaking the Bamboo forest for the Youkai Forest? Because if you are that clarifies a lot of things. Anyways, I just tweaked the random encounters for that area. In the next version encountering that particular formation will be as frequent as encountering two common fairies in Youkai Forest (which is low). One of the two optional bosses that will be featured in the next version. Mystia: "What would a maid be doing with these?" Cirno: "Ew... They're still warm." Wriggle: "Crap! It's the maid!" Sakuya: "Oh, it's the fairy and her friends... what's that behind your back..."
Cirno: "N-not any pads or anything!" Sakuya: "Well you now know my secret. Now I can't let you live." Chapter 1 is nearing completion and should have a playable demo up within the next week or so. EDIT: Progress on Chapter 1 is ahead of schedule, expect a demo within the next three days!! This is going to be the penultimate boss of Chapter 1, so definite spoilers ahead. I'm also planning on adding in a Bestiary when Chapter 1 comes out. Tell me what you think of this idea! -First Meiling cutscene was tweaked. -The frequency of randomly encountering the formation of 2 Petit Kedamas with a Flower Fairy was decreased in Youkai Forest. -Fadeout transitions were added for when Rumia and Wriggle join the party, in the previous version there was an abrupt jumping of the character's sprite to a new location. -Two optional bosses have been added. You get nice stuff if you beat them! Try to find them! -The game has a bestiary now! -Lets you look at stats, weaknesses, and possible drops of enemies and bosses. -Entries 35 - 148 are unused and are only there to prevent crashes for when I add new enemies and bosses in later versions. -fill entries 1 - 34 to complete chapter 1's bestiary! -The "Formation" option in the menu has been disabled. It is now impossible to have anyone but Cirno be the party leader. -Star Sapphire was made harder (higher chance of casting both "heal" and "anticipate". ), as a consequence,the battle against the 3 fairies has also increased in difficulty. -two optional spells were added, taught by the same NPC. -Dialogue may sound weird/out of character in some areas, Sorry! 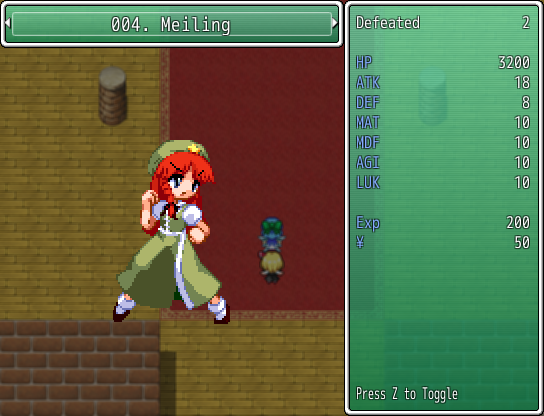 -If you somehow manage to defeat Meiling at the first encounter (or defeat the second encounter with an incomplete party), the game proceeds as if you have all four party members, despite missing members being absent. -returning to the SDM after the Yukari battle makes it so that you can no longer access the Road of Liminality and Mayohiga. Re: Team ⑨ Mystical Quest - (Touhou RPG) - Chapter 1 Complete! Well, here is something that is not on the list. Can you find two unusual things depicted here? Well, yeah. You can beat Meiling with just Cirno and Rumia. It's not even that hard if Rumia is level 4 (for the Blind spell... and yes, that requires a bit of grinding) and you have enough Potions. And since, according to the plot, Team ⑨ lost to Meiling during their first encounter, you can beat Meiling twice. And since the plot dictates you'll enter the mansion after beating Meiling during the second encounter, you can sequence-break and enter the mansion with just two members. Oh, and there's this line in the "after defeating Ran" cutscene - "Sound's good to me! What about you guys.". As far as I know, it should be "Sounds good to me! What about you guys?" Thank you for pointing out the Meiling problem. I'll probably upload a bugfix to remove the sequence break as soon as RPG maker stops giving me issues. I'll also correct that punctuation error. -Fixed Road of Liminality bug. Save files from Alpha v.2 appear to be compatible with the new version. Just copy your save files from the old version and paste them into the new folder and you're good to go! I was fighting some fairy maids in the mansion and this pops up after every 5th attack that connects. Sorry, I can't see the image (Most image host are blocked on my home network due to me having a younger sibling). Could you please describe what's happening, use a different image host such as this one, or upload the image as an attachment? Okay, I think I see what the problem is. Did you drag a save file from Alpha v.1 into either of the new versions, or is this a completely new save file? If you dragged an old save file from Alpha v.1 into the new versions, the problem is caused by the bestiary script trying to update with an enemy that, according to the script, previously didn't exist. that's why I said that save files from Alpha v.1 were incompatible with the other versions. I advise starting a new save file if this is the case. If the problem is on a new save file, then I don't know what the problem is since this problem shouldn't occur in the newer versions if you're using a new file. I'm pretty sure I'm using a v.2 save, but question is why does it happen in battle. It's tracking how many of an enemy you kill. So it causes errors when the enemy dies (Which is roughly the fifth hit for a fairy maid with non-overleveled characters.) the calcuation happens right before the death animation. I still suggest trying a new save file, if that doesn't work, I'll update with another bugfix (since the bestiary script I'm using literally just updated to a new version). Also, it's the very first fairy maid you "kill" that causes the problem, right? I'm just making sure. Also, did you ever open the bestiary prior to fighting the maids? After a short hiatus, work on this project has resumed. So I'm planning on having a segment of the upcoming chapter 2 (The Makai chapter) have two possible routes, one route involves Team ⑨ crossing an area of Makai where its miasma is more concentrated than normal. Entering this area will cause the team to begin experiencing the miasma's effects (Based on the description of it from the Touhou Wiki, I'm thinking of HP slowly ticking away, at the same time doubling the team's Magic Attack stat (or EXP rate, if it isn't OP). ), which makes this area difficult to pass through. Alternatively, the team could pass through a cave that bypasses the area. This route is slightly easier and lacks the status effect. 1. At the end of the cave the team encounters the Three Fairies, who cause a cave-in. This forces the team to backtrack and take the other route. However, on the way back, they encounter a boss (I'm thinking Kikuri (despite it not technically being from Makai...)) and upon defeating this boss they receive an item that makes the first route easier. 2. The bypass works as intended, allowing the team to skip the "miasma area" (I haven't yet decided on a name.). However, this causes the team to miss any items, unique enemy drops, and bosses that may be present in there. So let me know what you think about this! Which option sounds better/more fun gameplay-wise? If there's anything else about this idea that you have problems with or that you like, let me know! I believe that option 1 is the best option plot-wise. PS, Since the Youkai Mountain is in the game, will Sanae Kochiya and the Moriya Shrine play a role in the game later?